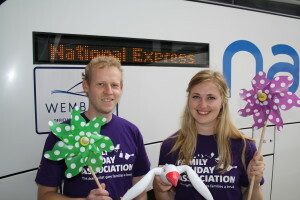 The Family Holiday Association has teamed up with the UK’s largest coach operator, National Express, to give out hundreds of coach tickets to families who can’t afford a break, in order for them to access a much-needed day out. The move means families all over the UK are enjoying trips away from home for the first time ever, with hundreds of cities, seasides and countryside spots to choose from. You can read more about the partnership here. The National Express scheme is part of the Summer Days Out project, which is helping to provide a day out for families who otherwise won’t have a break this year. As with the rest of the breaks we offer, our Summer Days Out are for families who are referred by a professional who knows them, for example a social worker, teacher or support worker. ll the National Express tickets have now been allocated, but there are still tickets available for National Trust and the Tower Bridge Exhibition for referral agents to apply for – perfect for weekends or the October half term!